Some think the word “Offal” is misspelled. Not me. I look for opportunities to eat the parts of a beast that are not the common – and popular and expensive — muscle groups: the internal organs and the like. First, they taste good. Often they are the most flavorful bits of the animal in question. Second, if a beast is going to give its life for my sustenance I am firmly convinced that it is ethically incumbent upon me to waste as little of that beast as possible. 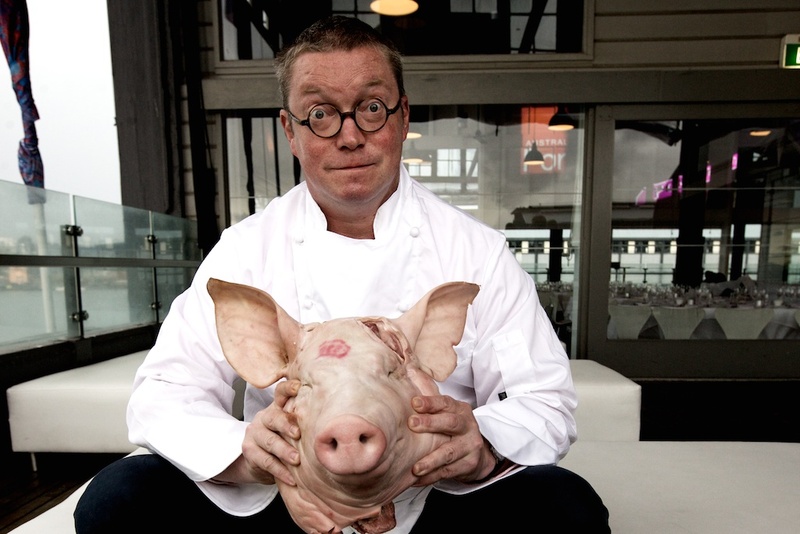 British chef Fergus Henderson popularized the notion of “nose to tail” cuisine and helped build it into a culinary movement dedicated to this principal. It is a movement that is rapidly gaining adherents and proponents in the United States, perhaps most notably Chris Cosentino of San Francisco’s Incanto. While I have never had the opportunity to put into practice the complete and literal notion of “nose to tail,” it is certainly a movement I support. Until I buy a deep freezer, however, my support lies in buying the “parts” that so many others disdain: sweetbreads, livers, brains, tripe, oxtails, shanks and the like. Aside from the fact that the relative unpopularity of these parts renders them inexpensive, their rich flavors is reason enough to focus on them. 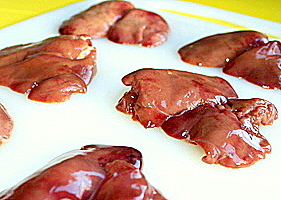 Chicken livers are many people’s first introduction to offal. Lacking the aggressive flavoring of their beefy cousins or the obvious “guts” aspect of tripe, chicken livers offer a certain comfortable and familiar quality. Often used in pates or offered as a tapa, sautéed with sherry, chicken livers are extremely versatile. Chicken livers feature a sweet richness that is not entirely unlike that of their force-fed duck or goose counterparts, but also a well-grounded earthy quality that has the hedonistic benefit of alleviating a certain amount of guilt. Our favored method for preparing the livers is one we stumbled upon by accident: grilling. We were barbecuing a whole chicken and didn’t want to waste the gizzards, so on the grill they went. The whole chicken turned out well and the heart was good too. But the liver was fantastic. The high heat of the grill seared the outside brilliantly and left the inside creamy and soft. It was a revelation. From the notion of grilled chicken livers it was only a few short steps to the grilled skewered meat street foods of Thailand. And from there, a modest adaptation of the pungent cilantro dipping sauce popular on Thai streets was an obvious addition. Prepare the chicken livers. 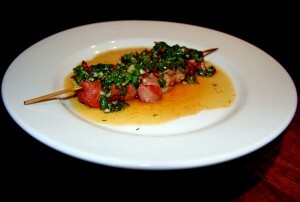 Thread the trimmed chicken livers onto skewers. Leave a little bit of space on the skewers between the livers. If using wooden skewers, which are perfectly appropriate, it is important to soak them in water for at least an hour before using them. Season the skewered levers with salt and pepper. Prepare and start the grill as necessary and appropriate to your set-up. Make the Cilantro-Lemon sauce. Finely chop the cilantro leaves and combine with the remaining sauce ingredients. Refrigerate the resulting sauce for at least half an hour before using. Grill the chicken livers. Grill the livers over moderate heat, turning once, until charred outside and still slightly pink within, about five minutes.